I cam to know of this book, Oracle Business Intelligence Applications: Deliver Value Through Rapid Implementations, written by veteran Oracle BI experts, Simon Miller and Will Hutchinson, published by Mc-Graw Hill, and expected to release in July 2013 (as per the publisher's site). The authors, Simon Miller and Will Hutchinson have between them over 40 years of experience in the area of business intelligence, and are eminently qualified to write this book. I have worked with Simon for over seven years, and can speak to his knowledge in Oracle BI. 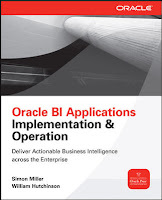 I look forward to the release of this book, and hope that practitioners of Oracle Business Intelligence Applications find this book to be a valuable aid in their work. This is a very short post, and meant to clarify a point of potential confusion. The recently released Oracle BI EE 11.1.1.7.0 release features integration with Oracle Endeca Information Discovery, both for use as a search engine and as a data source in BI Publisher. However, this integration is for version 2.4 of Endeca Information Discovery (doc, download). Support for the recently released version 3.0 (doc, download) is planned and not yet available. I will post an update as and when I have more information to share. An updated version of the Oracle BI Mobile HD app went live on the Apple iTunes App Store. This is an upgrade over the existing Oracle BI Mobile HD app, so users who have this app installed on their Apple iPad devices should see an update notification in their App Store app. This update makes the app available for the recently released Oracle BI 11g 11.1.1.7.0 release - which means you can connect this app to an Oracle BI server running the latest version. The latest release of Oracle Business Intelligence, 11g (11.1.1.7.0) is now available for download from the Oracle Technology Network (OTN). This is a significant release of Oracle BI and has enhancements across the stack. Breadcrumbs for contextual awareness and navigation. Hadoop integration in the BI Server, which can now connect to Apache Hadoop data sources, fire off Hive QL queries across federated data sources. Use a new, faceted user interface to search for your web catalog content. Directly launch content with the search criteria passed through as filters/prompts from the search results. A model checker to flag off possible errors or warnings in your model. Can also be invoked via the command line, which makes it easy to automate. Export dashboards to BI Publisher - the data models, layout, (supported) views and formats are carried over. Performance improvements in the Scorecard and Strategy product. A few links are in order now. Get the "Oracle Business Intelligence Developer Client Tools Installer"
The Repository Creation Utility is also available from the download page. Over the coming days and weeks there will be a ton of information put out on this release on the Oracle.com site, and disseminated via Twitter, Facebook, YouTube, LinkedIn, and other channels. Happy downloading and thank you.